Our five British species of this family are somewhat suggestive of Elateridae but distinguished by the three segmented club. Our four species of Trixagus Kugelann are keyed in joy; carinfrons (de Bonvouloir) and dermestoides (L.) represent our larger species, 2.5-3.3mm, while gracilis Wollaston (elateroides Heer in Joy) obturus (Curtis) are smaller, 1.5-2.3mm. Trixagus seriatus Blair, discovered and added to our list by Blair (1942) is now synonomised with T.carinifrons. 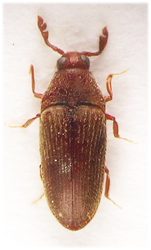 But for T.dermestoides, our most common species which extends into southern Scotland, all our species occur locally in southern England, the midlands and Wales. According to Unwin they refer sandy soils. T.gracilis occurs in early spring in saltmarshes around the Thames estuary and the south coast but there is also an inland record from the midlands. T.obtusus also occurs in saltmarshes as well as more generally. Adults of this family often occur among woodland litter or on tree trunks and occasionally climb low vegetation before sunset, they fly and come readily to MV light. Sieving or sweeping likely material is the best way to find them although they may also be extracted from winter flood refuse. When disturbed they lie still, usually for a long time, with appendages retracted into the body and so resemble small seeds which can make them very difficult to recognise among vegetable matter. They are, for the same reason, very difficult to set. Development is understood in only a few species: many larvae feed on fluids of ectomycorhizal fungi in soil among tree roots and undergo a two year life cycle (Hurka, 2005). Aulonothroscus brevicollis (de Bronvouloir), variously assigned to Trixagus, is rare with records from Herefordshire, Berkshire and elsewhere on old trees. Larvae develop under dead bark and in wood mould, probably mainly on Quercus (Alexander). This species would key to T.dermastoides in Joy but differs in having the eyes only slightly emarginate and the frontal carinae - longitudinal raised ridges inside the eyes - diverging posteriorly, see Ashe (1942). All species are fusiform and unicolorous drab; pitchy red or brown to entirely red or with the elytra sometimes darker. 1.5-3.3mm. Although the prosternal process is long and broad these species are unable to 'click' powerfully as do the elaterids. Head sunk into the prothorax to hind margin of eyes, eyes hairy and excised, at least to some extent, on front margin, only indistinctly so in Aulonothroscus. Punctate and pubescent with raised parallel or subparallel carinae from labrum to behind eyes. Antennae pubescent, 11 segmented; 1 elongate with a fine dorsal ridge, 2 quadrate with a dorsal depression, 3-5 quadrate, 6-8 transverse and 9-11 forming an asymetrical club, retractable into deep grooves on the propleuron. Pronotum with large punctures and dense recumbent pubescence, weakly bordered laterally, hind angles produced backward and hind margin strongly sinuate. Elytra densely pubescent with obviously punctate striae, epipleurae strongly narrowed at the level of the hind margin of the metasternum. Legs short and retractable into grooves on underside. Tibiae ridged on outer side. Tarsi 5-5-5; segment 1 long, 4 bilobed. Our species exhibit various forms of sexual dimorphism eg in demestoides and carinifrons the antennal club is expanded in the male, in gracilis there is a tooth near the base of the mid-tibiae in the male and the male obtusus have a dense comb of pubescence on the elytral margin.